I have revised this allopurinol medication information today. It is one of my oldest articles, and one of the most important. Once I understood why allopurinol can cause a gout flare it changed my life. Now I know that gout attacks can start when we first lower uric acid. 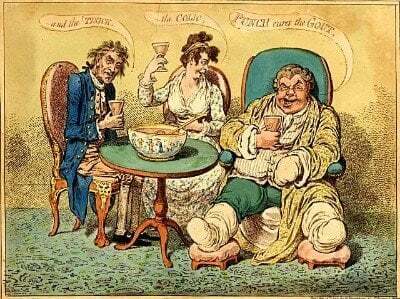 The reason for gout attacks when starting allopurinol is the most important fact you should learn about gout treatment. Because it explains the reason why gout can hurt even when you are doing the right things to control your uric acid. That fact also told me that I needed pain relief during the early weeks of allopurinol treatment. I was prepared, and I achieved safe uric acid levels without any major discomfort. If you do nothing else today, read my allopurinol medication article, and learn how to control gout before it controls you. All gout sufferers, and their carers, seek the best gout treatment. The best treatment is allopurinol medication, which is common and effective. It is a crucial part of the fight against gout, but why do less than 1 in 5 gout patients complete their treatment successfully? Are you at risk of your gout treatment failing? Do you understand uric acid? Do you know the crippling danger it presents? Do you know why you must reduce uric acid? Do you understand why reducing uric acid can temporarily cause more pain? As a gout patient, you must understand why you need to manage the pain of allopurinol medication to get rid of gout. Uric acid is useful to humans, but, like many a good thing, too much of it is bad. Too much, causes uric acid crystals to form in and around your joints, and under your skin. Many people imagine these crystals to be painful, often describing them as sharp and needle-like. They are actually so small, that they don’t cause physical pain directly, but your immune system sees them as virus-like invaders. Then, attacks them causing inflammation and acute pain. You must do more than just treat this pain – you must treat its cause. Most people need some additional medication to tolerate the pain. This is usually colchicine or another anti-inflammatory drug, but pain relief will do nothing to get rid of uric acid crystals. The inflammation and pain will gradually disperse as your immune system stops fighting the uric acid crystals. But, unlike a virus, your immune system cannot kill uric acid crystals. Instead, it hides them in a protein coating, and they will build up to cause crippling joint damage unless you do something to get rid of them. I’ve seen a 70-year-old man in tears with this pain, and I do not want it to happen to you. The uric acid crystals build up gradually, often over several years, and they don’t always cause the traditionally painful, swollen acute gout flare. Often numbness or tingling are the only signs, yet under your skin, the uric acid deposits increase until they burst through as tophi, or damage your joints, or both. The only way to get rid of uric acid deposits, and avoid the critically painful tophaceous gout stage, is to lower uric acid to 5mg/dL or below. Though there are several uric acid medicines, and new ones being developed, allopurinol medication is most widely prescribed and currently the most effective, as long as the correct dose is taken every day. At the correct dose, all uric acid lowering treatments will cause uric acid crystals to dissolve. Remember, this is what we must do to avoid skin-bursting tophi and crippling joint deposits. Unfortunately, as they are dissolving, uric acid crystals shed the protein coating, and the immune system starts to attack again, which may result in a painful gout flare. You must be prepared for this, and discuss with your doctor whether you take anti-inflammatory pain relief with the allopurinol medication, or take pain relief when a gout flare occurs. All too often gout sufferers concentrate on finding pain relief and forget about the dangers of a long-term buildup of uric acid crystals. You must understand the dangers of uric acid, how crystals can cause serious damage, often without pain, and how lowering uric acid might temporarily increase pain. Distinguishing between pain relief and lowering uric acid is crucial for managing gout. Understand it, and you are less likely to fail. Do not be one of the gout patients who fail to get rid of gout because you do not understand allopurinol medication. 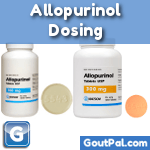 Allopurinol for gout is the best way to lower uric acid. But it’s dangerous to get it wrong. Most doctors get it wrong. Also many patients don’t listen when doctors get it right. Get safe allopurinol for your gout. Leave Allopurinol Medication to browse Great Day for Gout.